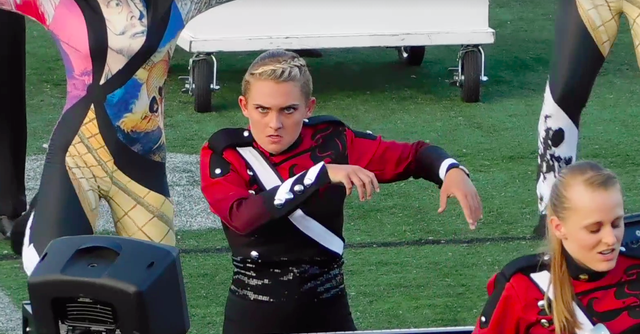 This Boston Crusaders pit member is going viral after a video of her playing keyboards during a recent DCI show exploded in popularity due to her facial expressions and commitment to her role in selling the intensity of the corps 2016 show "Quixotic" to fans. @FunnyPicsDepot some of the facial expressions made me think of Lurch playing the harpsichord on the Addams Family! The keyboardist is Anna Eberhart. Anna is a student at John H. Guyer High School in Denton, TX and is their band's Drum Major. She now can add viral sensation to her college band application and she has also gained a few fans including Grammy winning composer Eric Whitacre. Here's her performance. Share and enjoy!